The Linksys Wireless-G Access Points can be configured as an Access Point, Access Point Client, Wireless Repeater, and Wireless Bridge. Wireless-G Access Points by default are set to Access Point Mode. To check if the access point is set to Access Point Mode, follow the instructions below. NOTE: The AP Mode options on the access point depend on its version number. Log on to the access point's web-based setup page. For instructions, click here. NOTE: If you are using Mac to access the access point’s web-based setup page, click here. When the access point’s web-based setup page opens, click AP Mode and make sure Access Point (default) is selected. NOTE: If the WAP54G v1.1 is not set to Access Point, select Access Point (default) then click Apply. Click Apply if you made any changes. Connect the Linksys access point to one of the router's Ethernet (1, 2, 3 or 4) ports. Access the web-based setup page. For instructions, click here. 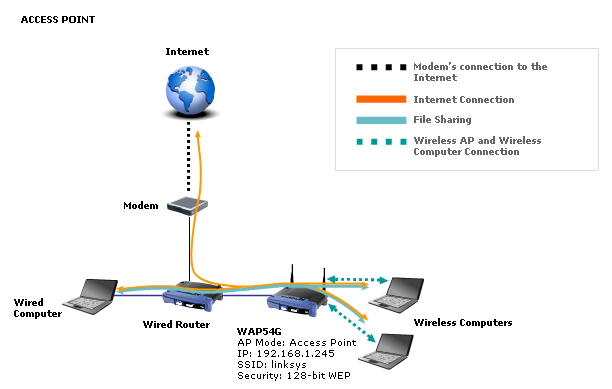 When the access point’s web-based setup page appears, click AP Mode and make sure that Access Point (default) is selected. QUICK TIP: When configuring the access point in AP mode, make sure also its wireless settings are the same with the router. To check the wireless settings of your Linksys access point, click here. Click if you made any changes.